We delivered a unique ‘superloo’ design featuring Silestone vanities complete with glass upstands featuring a bespoke bronze effect hexagonal design. The adjacent properties at 5-9 Cork Street in Mayfair have been completely refurbished inside while the existing stone façade has been retained. The newly refurbished building, which sits just a stone’s throw away from the Royal Academy of Arts in London’s West End, is now home to several retail units plus high quality office accommodation. 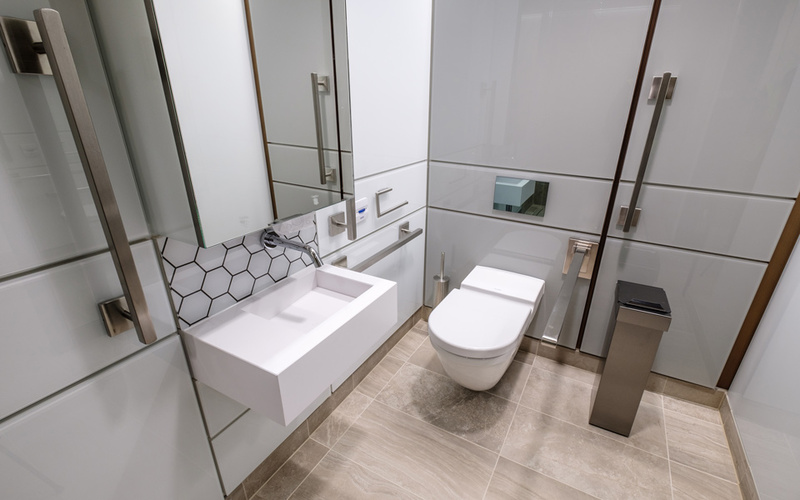 Working with Kier over the course of five months we manufactured and installed individual ‘superloos’ on six floors of the building, from the ground to fifth floor. 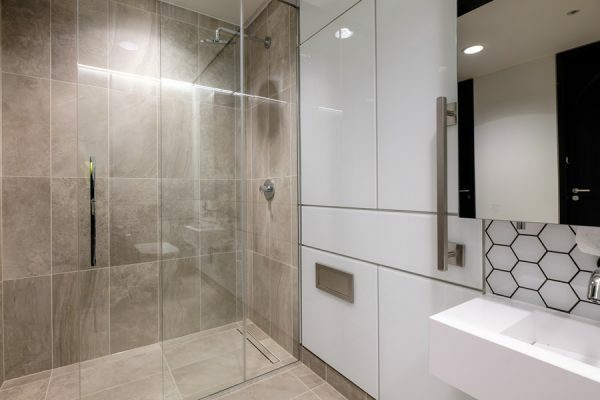 The self-contained cubicles, which each include a WC, bespoke white Silestone vanity unit and hand-drying facilities, are the ideal way to maximise the available space on each floor of the building. 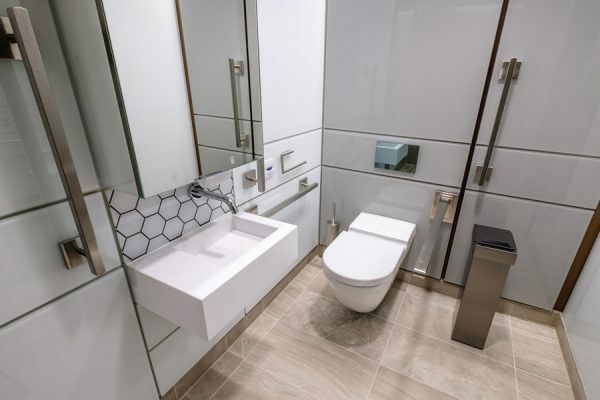 We also installed disabled toilets fitted out to exactly the same specification and finish to ensure consistency of design was achieved throughout the building. Each superloo toilet cubicle features a unique back-painted glass upstand with an inset hexagonal pattern in bronze to create a stand-out 3D effect design to mirror the high specification interior design delivered for the rest of the newly refurbished building. Our Concerto integrated duct panels, faced with back-painted toughened glass in two colours; grey for duct panels behind the WCs and white for the panels fitted underneath each vanity unit. The panels are completed with bronze look metal vertical sections between each panel for a truly unique finish. 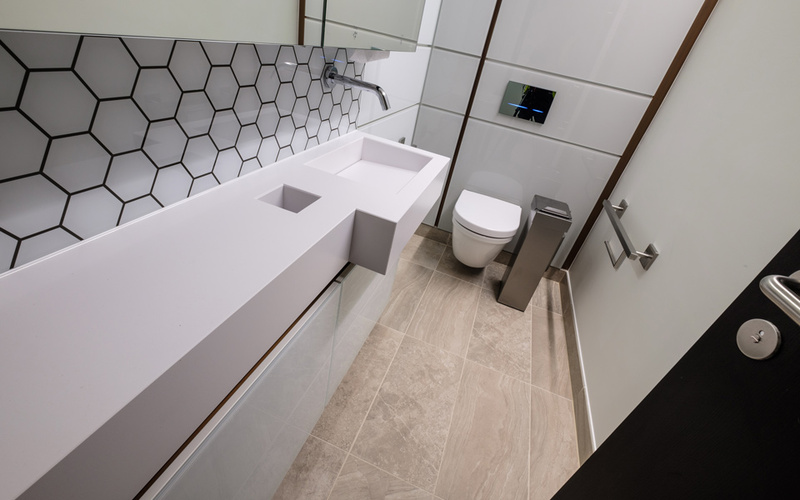 We designed each individual Silestone vanity trough unit with an integral cupboard and waste bin which, together with the Dolphin Alavo mirror system, is designed to keep the washroom area clean and tidy. 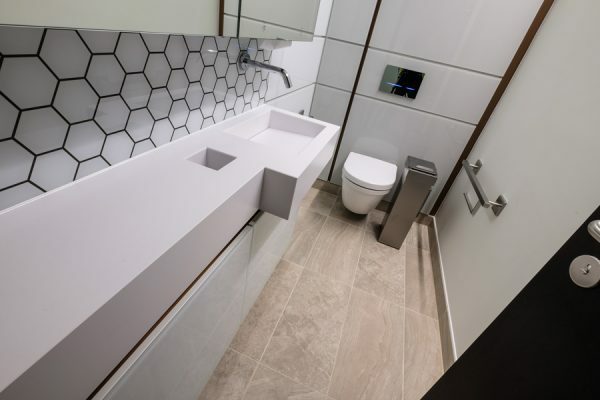 Manufactured from natural quartz, Silestone is a hard-wearing, durable material with added antibacterial properties making it the perfect choice for high traffic areas such as office washrooms. As part of the project, we also created the new staff shower and changing area in the basement of the building with washrooms and showers as well as changing cubicles, benches and lockers. Installing Silestone vanities together with glass upstands as well as drawing from the same colour scheme cemented the link between different areas of the building. Our glass iLockers, manufactured with a hardwearing aluminium carcass and radiused back corners for ease of cleaning, were back-painted to a cool grey shade and completed with secure key locks. The flush front design creates a perfectly sleek appearance and adds a touch of luxury together with our bespoke Legato benching, finished in a complementary light grey. 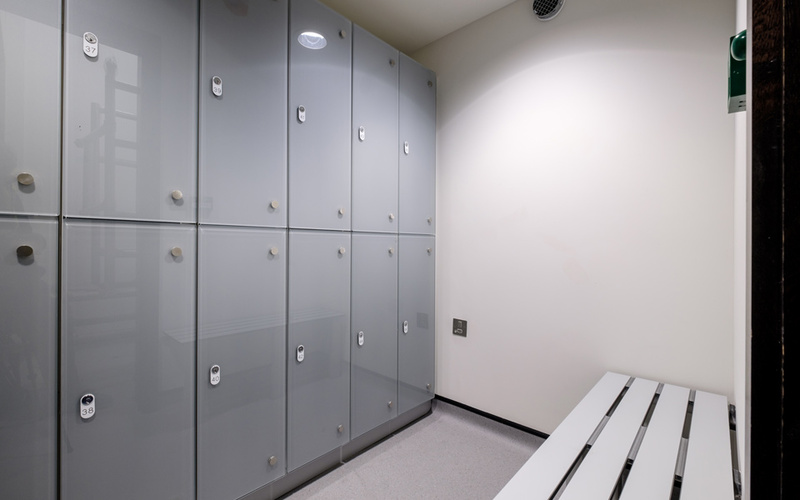 The result is a changing area that wouldn’t look out of place in a luxury health club.